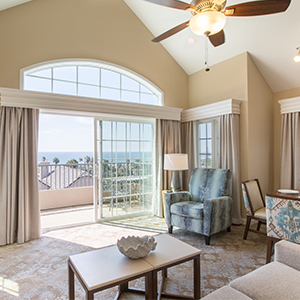 Your vacation rental features all the subdued luxury of Del Mar in a plush, one-bedroom suite. All you have to do is step onto your private balcony to enjoy the ocean views. There’s no need for air conditioning here—simply open the French doors to welcome the gentle breeze. Each rental comes with a fireplace, perfect for winter nights.